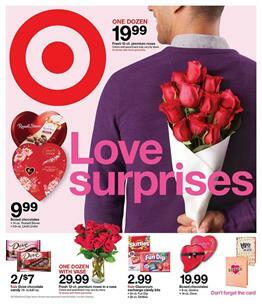 Browse the new preview for Target Weekly Ad Valentine's Day Gifts that are under $10. Exchange cards of Avengers, PJ Masks, Disney Princess, Paw Patrol, and Black Panther are among these gifts on pg 2. Heyday gifts is a part where you can find earbuds, watch band, chargers, and more electronic accessories. To be clear, we can say that this is a classic concept of gifts for a day like Valentine's Day. Toys are also nice and warm gifts and a lot of adults love them, too. Many new toy deals are available in this Target Ad Preview which is valid on Feb 10 - 16. Pikmi Pops bubble pops, Boxy girls doll, Play-Doh wheels crane and forklift are all new products on pg 3. Get a 20% discount on Disney Princess toys. Also, see video and table games including Jumanji and pre-order of Anthem. Anthem will be a game where you can customize your suit like Iron Man's. It will be available for all platforms soon. The Lego Movie 2 toys are also available in the ad. Check out pg 10 for LEGO sets, exclusive LEGO Movie 2 pre-order, and MetalBeard's heavy metal motor trike! set priced at only $59.99! Find storage products, kitchen appliances, living room furniture, and Love & Liberty Event on the Target Weekly Ad Feb 10 - 16. Explore products from the apparels category. You can see nice deals on electronics, smartphones, game consoles, video games etc. Bohemian Rhapsody 4K Blu-Ray disk is one of the new movies at Target. Check out pg 20 for details. Target also sells outdoor furniture for lowered prices. Grills, seat settings, Project 62 furniture and more might also be interesting for those who want to renew their backyard.